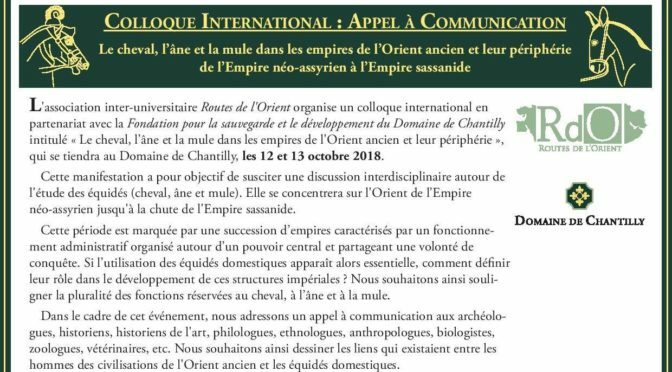 Vous pourrez trouver l’actualité des appels à communication à des conférences ou à des colloques relayez par l’association ayant pour thématique l’Orient au sens large. 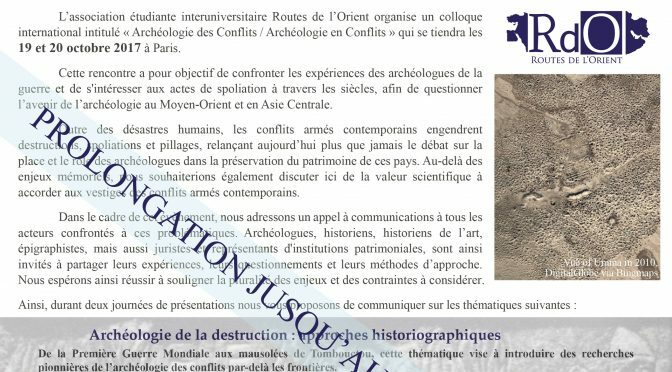 Archéologie des conflits / Archaeology of Conflict, Billets, Call for Papers, Conférences, expositions, évènements. This session brings together scholars investigating regional-scale problems of settlement history and archaeological landscapes across the ancient Near East. Research presented in the session is linked methodologically through the use of regional survey, remote sensing, and environmental studies to document ancient settlements, communication routes, field systems and other evidence of human activity that is inscribed in the landscape. Session participants are especially encouraged to offer analyses of these regional archaeological data that explore political, economic, and cultural aspects of ancient settlement systems as well as their dynamic interaction with the natural environment. The program ARABIA was initiated in June 2013 by Guillaume Gernez (University Paris 1 Panthéon-Sorbonne) and Sophie Méry (CNRS). After being a partner for the « Rencontres Sabéennes » in Paris (June 2013), it then took part of the LabEx DynamiTe, with the first workshop held in Nanterre in May 2014. The main aim of this 5 years program is to create links between specialists and to build a group of researchers and PhD students in ancient Arabia, focusing on topics related to the concept of territoriality. Annual workshop will take place, and a final conference (then published) is previewed in 2018. This project also intended. For this second workshop, in February 2016, the CEFAS and the National Council for Culture, Arts & Letters offer the opportunity to organize a meeting in Kuwait, with international researchers, a large part of them being directors of archaeological operations and actors of archaeology and heritage in the region, dealing with new data, new methods and recent works. 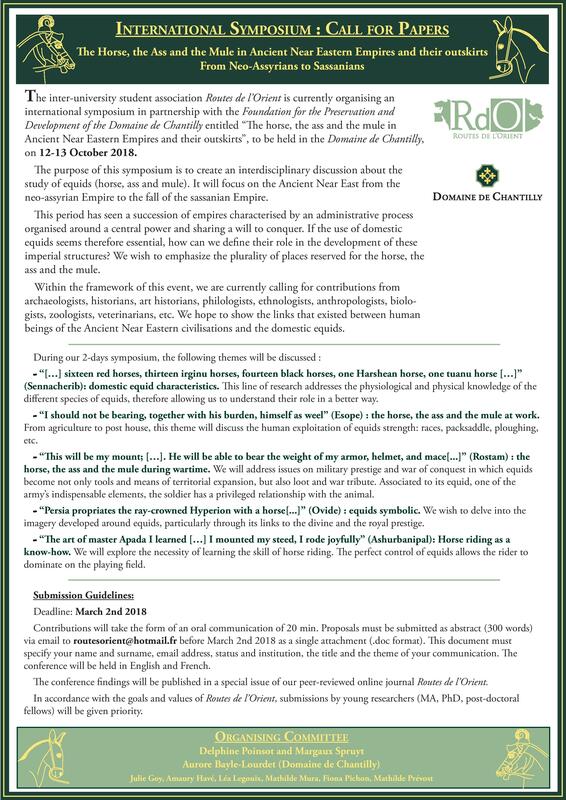 The diachronic theme will be focused on « territories, settlement patterns and interactions in Arabic Peninsula », including the questions of sedentism and nomadism, from Neolithic to the eve of the Islamic period. Production and diffusion of copper/bronze weapons in Eastern Arabia during the Bronze and Iron Age. A project for Failaka : An island dedicated to archaeology and cultural tourism. The Archaeology of Iran session(s) will provide a forum for researchers currently engaged in the study of archaeological materials from Iran, bringing together field reports and material studies spanning early prehistory to the Islamic period. Sessions devoted to the Archaeology of Iran will include both Iranian and non-Iranians allowing scholars to disseminate their latest results, share ideas, receive feedback and make contacts. Description: The emergence of phenomenological approaches to landscape and the built environment has encouraged the present and ever-growing interest in sensorial experience and affectivity in the fields of archaeology, anthropology, art history, and text studies (Merleau-Ponty 1962; Tilley 1994; Hamilakis 2013). Questions of the tactile, auditory, olfactory, and gustatory phenomena of objects, spaces, and practices are starting to be explored with as much ardor as the visual, visuality being the most accessible sense for archaeologists and historians to reconstruct. Such pursuits benefit from a treatment of the senses and sense-making not as isolated passive encounters of an individual moving through the world, but rather as being intricately connected and constituted by a person’s active cultural and social context and memory. Contributions to this session will take a multiplicity of theoretical and methodological approaches that individually yield insight into representation, reception, and interaction in the ancient world, the traces of which are preserved and accessible in both material and textual forms. This broad spectrum of papers will help bring to light culturally meaningful sensory experience, as well as the social and political dynamics of past worlds and human encounters. at the Johannes Gutenberg-University Mainz (Germany). For its International Conference the RTG wants to focus on the process of developing and legitimizing knowledge. The conference aims at answering questions dealing with the creation and justification of knowledge, such as: How is ‘foreign’ knowledge given authority? What are the mechanisms of legitimation? Are the ascriptions by the sources concerning the knowledge’s origin (inherited or borrowed) traceable or artificial and unfounded? Does transferred knowledge create new concepts during the act of borrowing? Are there special fields of knowledge that are linked to certain societies or social groups? 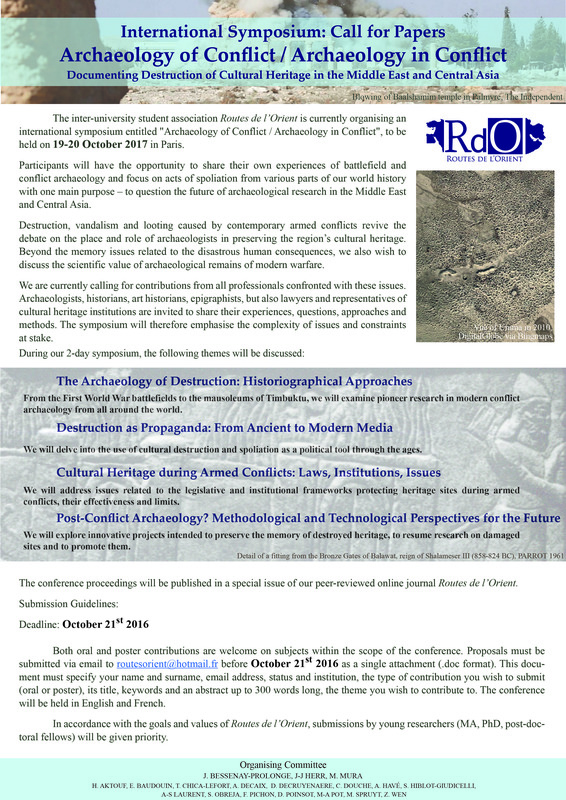 We want to invite interested scholars of the academic fields of our RTG (Egyptology, Ancient Near Eastern Studies, Near Eastern Archaeology, Classical Philology, Classical Archaeology, Medieval German Studies, Byzantine Studies, and Medical History) to apply and to deliver papers fitting to one of the four sections or to methodological and theoretical aspects. We in particular also encourage scholars of academic fields not included in the RTG but related to any other field of cultural studies (including the study of modern societies) to apply. We ask those interested in delivering a paper to send an abstract of about 300 words along with a short academic biography to the RTG at mailto:grk1876@uni-mainz.de by Monday, 29th of February 2016. Papers should be presented in English. Travel and accommodation costs will be paid for all successful applicants. More information about the RTG, its aims, the disciplines involved and the projects of the PhD students can be found on its website: http://www.grk-konzepte-mensch-natur.uni-mainz.de/. 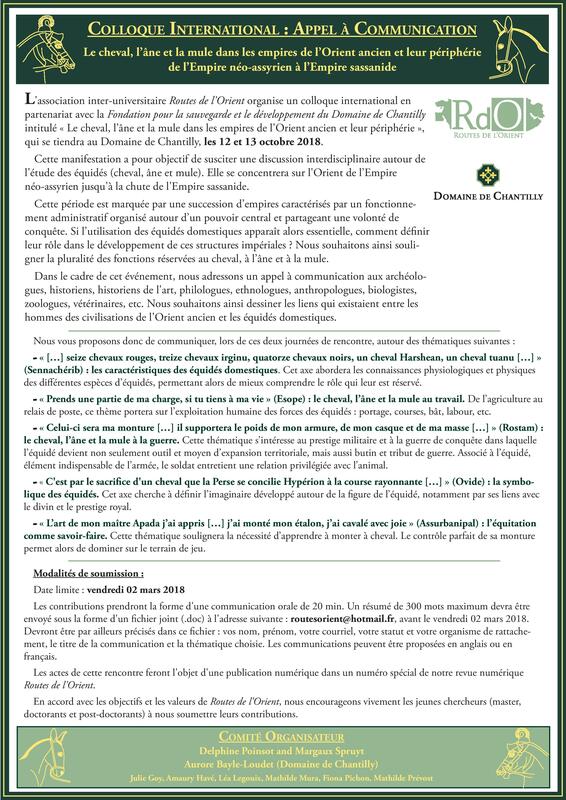 Billets, Call for Papers, Conférences, expositions, évènements. and the development and functioning of social complexity. Breasted Hall, The Oriental Institute, University of Chicago, 1155 East 58th St. Chicago IL 60637. The symposia is free of charge and no registration is needed! This is the Second Circular of the 28th International Congress of Papyrology, to be held at the University Pompeu Fabra, Barcelona, between 1 and 6 August 2016. In the first place, the organizing committee would like to thank the enthusiasm with which the papyrological community has welcomed the preparation of this edition of the Congress in Barcelona. There are several hotels representing a selection of standards in the neighbourhood of the Congress venue. The organizers have negotiated special rates for Congress participants in some of them, but please note that these are subject to availability at the time the request is made. Information, links and registration forms are available on the Congress website. Participants are encouraged to book early in order to ensure the accommodation of their choice. As announced in the first circular, five days of sessions will be scheduled, leaving Wednesday afternoon free. The sixth day will be reserved for the General Assembly of the AIP and devoted to obituaries and a general discussion of current problems in our discipline. Papers will be presented in one of the following languages: English, French, German, and Italian and will be restricted to only one paper per person, including shared communications. We encourage the use of posters for work-in-progress presentations. There will be two plenary sessions, at the opening and the closure of the Congress, and five parallel sessions with 20 minutes papers, followed by a 10 minute discussion. The number and subject matter of panels are yet to be determined according to the proposals admitted. We remind participants that the deadline for abstract submission is 28 February and that it should be done online from our webpage. We are very pleased to announce that the president of the AIP, Andrea Jördens, has accepted to address the papyrological community in the inaugural plenary session. The closing plenary session will take the form of a round table in which several participants will reflect on the boundaries of our discipline from different perspectives, and where participation from the public will be welcome. Poster presentations Participants will also have the opportunity to present posters. Posters may be autonomous contributions or complement a paper, and may be presented by individual researchers or research teams. Dimensions must be: height max. 2 m x width max. 1 m.
They will be displayed in the common areas close to the conference rooms for the duration of the Congress. Poster proposals should be submitted to the organization of the Congress in the same way as abstracts, and, once they are accepted, posters should be delivered not later 1 August 2016, when they may be handed in at the administration desk of the Congress. 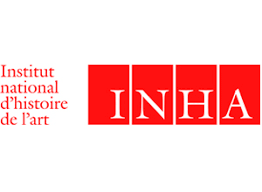 It is now possible to register as a book exhibitor for the five full days of the Congress (1–5 August). Registration will ensure a stand and a pass for participation in all the activities of the Congress; more information is available at the Congress website. To register as a book exhibitor you may use the eventum page of the 28th International Congress of Papyrology, from which you will be able to register for the Congress and to pay for the corresponding fee. Social events The city of Barcelona and the surrounding areas have numerous interesting places to visit, and the cultural offer is extremely rich. In addition to this, the Organizing Committee is preparing several social activities for the days of the Congress, of some of which we can advance the following information: Monday 1 August a reception will take place at the University Pompeu Fabra, where the University academic authorities will welcome the participants. A papyrus exhibition will take place at the Archivo de la Corona de Aragón with documents and other objects from the two papyrus collections of Barcelona, the Abadia de Montserrat and the Palau-Ribes collections. The exhibition will open 17 March and a guided tour will be offered to the participants during the week of the Congress. As is traditional, a dinner and a farewell party will be offered Friday 5 August at the closing of the Congress. Further details of these and other activities will be provided in subsequent circulars and in our website. Excursions The Organizing Committee has arranged some attractive tours open for participants and accompanying persons to take place in the days immediately following the Congress. Saturday 6 August: Tarragona. The approximate price will be 95€ including travel expenses, lunch, tickets to the archaeological site and the museum, as well as a guided tour. Sunday 7 August: Ampuries and Ullastret. The approximate price will be 95€, including travel expenses, lunch, tickets to the archaeological sites, as well as guided tours. Details have been published on the Congress website. During the process of registering for the Congress you will be asked about your interest in joining in one or both trips. Once we make sure we have enough participants we will proceed to contact those interested so that payment procedures can be started. For any doubts or further queries concerning the trips, please email us at papyrologia@upf.edu. Important dates Let us finally remind you of some important dates regarding the development of the Congress. Please note that registration for the Congress is independent from abstract submission, and that registering at the preferential fee will end 28 February.